This thing rocks, and is possibly the best running shoe I've ever had. As you can see from the pic there's very little heal to toe raise (good for a full elastic flex and preventing heal slamming as first contact). They're light at 6.4 oz, and they hold up better than many flats I've had. Just resting these puppies in your hand they feel like a feather, and though all your friends will tell you "oh I can't run in those" I've done weekly 17 milers on Sundays in them for weeks now (and all the miles between). The official description follows: "The adidas adiZero RC 2 is an incredibly lightweight, yet well-cushioned racing flat for the competitive runner with a neutral foot strike. Air mesh upper. adiPRENE® provides protection from harmful impact forces. adiPRENE®+ maintains forefoot propulsion and efficiency. Torsion® System adds midfoot integrity. 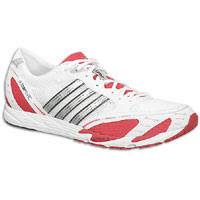 adiWEAR® outsole offers best durability in high wear areas. DSP delivers perfect grip, high durability and light weight."